I'm stumped by this one! 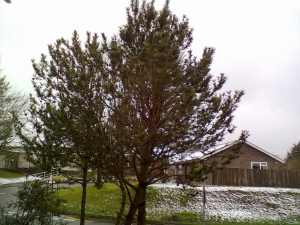 Medium sized evergreen tree, but multi-stemmed with the base covered in ivy. It is possible that it was chopped/damaged at an early stage, as it is on a roadside verge, next to a footpath. Needles in pairs, 3" (7-8cms)shiny on the outside, grooved on the inside: clear bright green, minutely serrulate. Fascicles long, nearly half an inch (1cm). Cones just over 1" in length (2cms), scales centrally ridged so they feel "knobbly" but not prickles. Buds long - 7/10ths ", or about 1.8 cms - smoothly pointed, pointed scales, brown in colour but with a resinous scurfy "skin". Foliage in "spurts" along the branches, not evenly distributed at all. Think this might be called "layered foliage", not sure. Overall shape rounded, branches ascending: a little hard to be certain of shape as it is multi-stemmed. Keys out in Mitchell as P. nigra var nigra but there are several features that don't match, ie shape of buds not abruptly pointed, shoots not shiny, leaves not "nearly black", and the cones are way, way too small. Considered P. mugo, due to the multi-stemming, but that does not have layered foliage, the buds on this one are too large, and the leaves don't seem dark enough.